“The scariest thing that’s ever happened to me was when I was diagnosed two years ago in May with breast cancer, had an operation, and 6 weeks of treatments. The very first day I was going for radiation, I found out our friend, Devlin, lost her battle. I am now blessed with being a survivor for 2 years! I also have at least a dozen other girlfriends who are blessed to be survivors! One friend was recently diagnosed and is having surgery this month. Therefore, my Mingle for Charity event will again benefit The IIIB’s Foundation, a non-profit 501(c)(3). My friend and former customer started these efforts 14 years ago, Carolyn Cole-Rodenburg, also a survivor. You may not know, but depending on your diagnosis, and what you have to endure with treatments, there are things you never thought you will need while going through breast cancer. 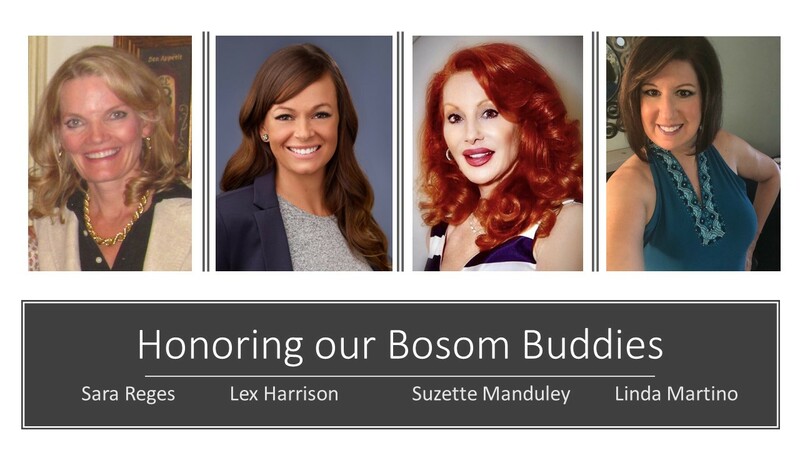 The IIIB’s Foundation, aka Bosom Buddy Baskets, is a non-profit organization dedicated to comforting women going through the pain associated with breast cancer and providing these items and resources through their Bosom Buddy Baskets, given to women when they wake up in the hospital following breast cancer surgery. Please join us to support family and friends enduring the pain of breast cancer”. Sponsor a Bosom Buddy Basket for a breast cancer patient in need! Tickets $75 at the door! PLEASE CONSIDER SPONSORING THE 12TH ANUUAL MINGLE FOR CHARITY! PLEASE CLICK BUTTON BELOW IF YOU ARE INTERESTED IN BECOMING A SPONSOR! We are anticipating a highly successful and well-attended 12th Annual Mingle for Charity and are confident this will be an enjoyable time for all! We look forward to your participation and commitment to helping breast cancer patients with your sponsorship. Carolyn thanks you in advance for your support for a cause that is so dear to her heart! Thank you so much for your caring and kind support! We look forward to seeing you and having fun mingling on October 18, 2018. If you are unable to attend The 12th Annual Mingle for Charity and you would like to make a difference for breast cancer patients today, please donate any amount below. The IIIB’s Foundation is a 501(c)(3) charity – Tax ID# 45-2048456. To control expenses, The IIIB’s Foundation will send receipts for gifts of $250.00 or more. If you have any questions, email theiiibs@keepthecandleglowing.org.